In this tutorial, we’ll go through how to build a photo feed with React and Cloudinary, while providing realtime updates to the feed using Pusher Channels. You can find the entire source code of the application in this GitHub repository. Let’s set up a simple Node server for the purpose of uploading images to Cloudinary and triggering realtime updates with Pusher. express: A minimal and flexible Node.js server. nedb: In memory database for Node.js. connect-multiparty: Express middleware for parsing uploaded files. body-parser: Express middleware for parsing incoming request bodies. dotenv: Loads environmental variables from .env file into process.env. pusher: Server SDK for Pusher Channels. Hard-coding credentials in your code is a bad practice so we’ve set up dotenv to load the app’s credentials from variables.env and make them available on process.env. We are going to create two routes for our application: the first one will serve all gallery images, while the second one handles the addition of a new image to the database. When this endpoint is hit, a JSON representation of all images that exist in the database will be sent to the client, except if an error is encountered, in which case a 500 server error will be sent instead. Next, let’s add the route that adds new images sent from the client to the database. 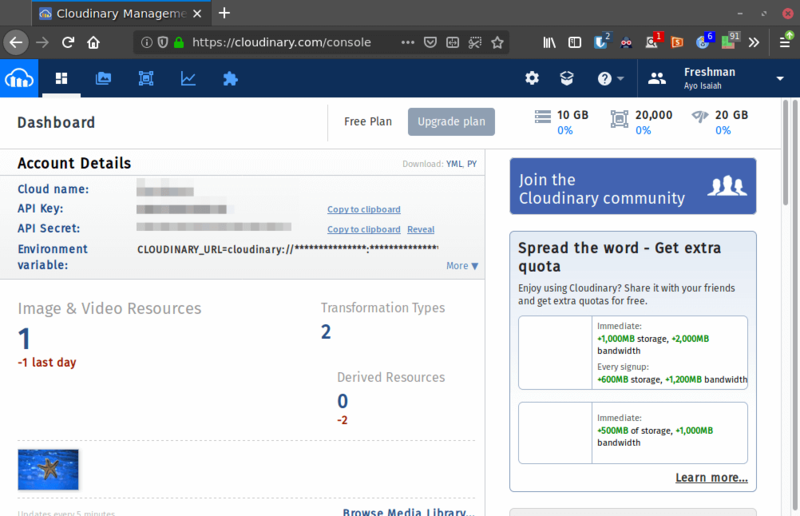 Here, the image is uploaded to Cloudinary and, on successful upload, a database entry is created for the image and a new upload event is emitted for the gallery channel along with the payload of the newly created item. The code for the server is now complete. You can start it by running node server.js in your terminal. This command will create a new folder called client in the root of your project directory, and install all the dependencies needed to build and run the React application. pusher-js: Client SDK for Pusher. axios: Promise based HTTP client for the browser and Node. Finally, start the development server by running yarn start from within the root of the client directory. I know that’s a lot of code to process in one go, so let me break it down a bit. The state of our application is initialized with three values: images is an array that will contain all images in our photo feed, while selectedFile represents the currently selected file in the file input. loading is a Boolean property that acts as a flag to indicate whether the loading component, Spinner, should be rendered on the page or not. When the user selects a new image, the fileChangedHandler() function is invoked, which causes selectedFile to point to the selected image. The Upload button triggers a form submission, causing uploadImage() to run. This function basically sends the image to the server and through an axios post request. In the componetDidMount() lifecycle method, we try to fetch all the images that exist in the database (if any) so that on page refresh, the feed is populated with existing images. You have now learned how easy it is to create a live feed and update several clients with incoming updates in realtime with Pusher.